FM radio is big in Douentza, Mali, where most of the 28,000 locals are loyal listeners who tune in regularly. The on-air programming in this remote town just south of the Sahara Desert is uniquely Malian, with a musical emphasis on traditional indigenous instruments such as the lute-like kora and the dunun drum. Much of the music features a call-and-response style that retains a central role in Malian culture and is famous for influencing American blues and rock ’n roll. The song was written and performed by Troupe de Haire, a popular local band, but commissioned by a team from the Northwestern Access to Health Project—a multidisciplinary group of Northwestern graduate students and faculty who work with non-governmental organizations in the developing world to promote improved health outcomes. The project unites students from Northwestern University’s School of Law, Kellogg School of Management, and Feinberg School of Medicine. Through their collaboration, the University “has the opportunity to simultaneously educate its students as global citizens, while also engaging meaningfully in specific global community health projects that result in sustainable, capacity-building interventions,” said Juliet Sorensen, clinical associate professor of law with the Bluhm Legal Clinic's Center for International Human Rights, who oversees the Access to Health Project. 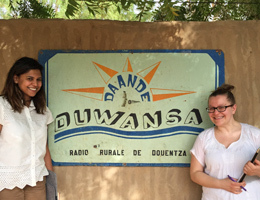 Uttara Dukkipati (JD-MBA expected 2015) and Ariel Moser, an MPH student at the Feinberg School of Medicine, at station 107.6 FM, "Radio Daande: The Voice of Douentza," Douentza, Mali. For the last four years, Sorensen has taught Health and Human Rights, a course that includes students from all three schools. The class is primarily doctrinal, examining “what it means for there to be a right to health, along with how is it upheld, enforced, or disregarded around the world,” Sorensen explained. But the class is best known for its secondary focus: specific projects such as the one in Douentza. Other projects have focused on Ethiopia, the Dominican Republic, and the Democratic Republic of the Congo. To tackle the projects, the class divides into multidisciplinary teams that research the cultural, legal, political, and economic climate of each region, as well as the health issues the teams plan to address. Each team has between five and ten members. Taking the class doesn’t mean you have to travel to the region you’re studying, but the opportunity exists and many students have done so. For law students, the projects present a unique opportunity to work alongside colleagues from other fields, and to tackle challenging problems in international contexts. “This is concrete, real-world problem-solving,” said Anna Mathai (JD expected 2016) whose project focused on reopening a shuttered Sudanese health clinic. Sorensen is a veteran practitioner as well as an educator, and she has plenty of experience with international public-interest projects: She spent two years in Morocco as a U.S. Peace Corps volunteer working on maternal and child health issues after earning her undergraduate degree from Princeton University in 1995. She moved to Chicago in 2003 to become an assistant U.S. attorney, where her work included training lawyers and judges in Colombia and Benin on behalf of the Department of Justice Office of Prosecutorial Development, Assistance and Training, and remained in that post until 2010, when she joined the Law School faculty. She founded the Access to Health Project that same year. In planning the Health and Human Rights course for the 2013–14 school year, Sorensen realized that Mali offered a number of interesting possibilities. She had worked with the New York-based Near East Foundation (NEF), which is known for long term sustainable development work and permanent, local in-country staff, as a Peace Corps Volunteer in rural Morocco. NEF has worked in Mali for over thirty years, and the organization’s president suggested Douentza as an optimal site for health and human rights work. Sorensen was also compelled by the struggle in Mali to eradicate female genital mutilation (FGM). In 2012, the local government of Douentza was overthrown not once but twice, first by nomadic Touareg rebels and later by Islamic jihadists. The jihadists arrived in the fall and imposed Sharia law, a strict Islamic religious code. Douentza is a predominantly Muslim village, but the implementation of Sharia law created culture shock that was made all the more shocking by the violence of the reprisals: the armed occupiers, who took up residence at the local hotel and school, beat locals who failed to comply with the new regulations. Radio Daande, the station at 107.6 FM, was allowed to broadcast only when the station manager agreed to read the Koran aloud for four hours a day. By the time French warplanes liberated Douentza by bombing the hotel and school in early 2013, the town had been under occupation for a year, and many residents had fled. Yet Sorensen’s students were committed to making the town a focal point of their efforts. In the spring of 2014, a team went to Douentza to meet with residents and local leaders and determine how they could help. That trip yielded two specific projects. The first was musical: the team commissioned an album of songs that espoused health-related messages to be played on Radio Daande—topics include malaria, HIV, and breastfeeding, in addition to FGM. Troupe de Haire signed on, and a Malian doctor agreed to review the medical accuracy of the songs. Mali has a high rate of illiteracy, along with a renowned oral tradition, which is one of the reasons for the popularity of radio; the Northwestern team’s decision to pursue musical messaging was in keeping with generations of Malian tradition. The second project took an entrepreneurial approach to the problem of FGM. The Northwestern team learned that most FGM practitioners—called “cutters”—would change careers if presented with a reasonable alternative. Douentza was sufficiently remote that the team, after conferring with local leaders, judged that the cutters were unlikely to be quickly replaced, so they worked with the NEF to create opportunities for the cutters to pursue different livelihoods. The purpose of the 2015 visit was to measure the success of the programs and plan next steps. When the team returned in March, not only had the album been written and recorded, but it also had been released and was receiving regular airplay on Radio Daande. The team wanted next to understand to what extent the album was changing perceptions. The project with the cutters had seen similar progress: 10 of the area’s 11 cutters had changed careers, with nine of the women opting to raise sheep and goats, and the tenth choosing to sell ice cream. Word of the program’s success has reached multiple cutters in outlying villages, who have approached the project manager to begin the process of switching occupations. Sorensen believes that addressing the economic component of the practice, in addition to community education and outreach will help communities working toward eradication, and she is encouraged by the early results. Sorensen said that the local champions in Douentza are world-class, and that they are crucial to the success there. These include Laya Ongoiba, a tireless women’s advocate who has been battling FGM for more than a decade, and Boucary Tamboura, Radio Daande’s station manager. It was Tamboura who negotiated with the jihadists to keep the station broadcasting during 2012, an act of bravery that deeply impressed the students. The sentiment is similar regarding Ongoiba: “She has been working on changing attitudes around FGM for many years. That is very difficult, and we’re very lucky to have a partner who has been working to sensitize the community to the dangers of FGM for so long,” said Ariel Moser, a student in the Master in Public Health program at Feinberg who also traveled to Mali this spring.